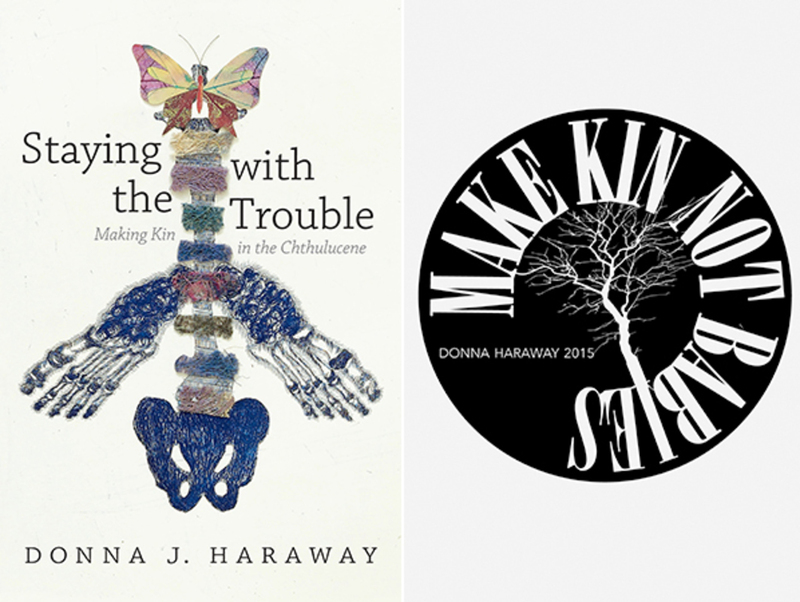 Left: Cover of Donna Haraway’s Staying with the Trouble: Making Kin in the Chthulucene (2016). Right: A design by Elaine Gan for the exhibit “DUMP!” at Kunsthal Aarhus, 2015. From her classic Cyborg Manifesto, first published three decades ago, to her latest arguments about the “Chthulucene,” multispecies feminist theorist Donna J. Haraway is one of our most daring thinkers. A distinguished professor emerita in the history of consciousness department at the University of California, Santa Cruz, Haraway has recently published her latest book, Staying with the Trouble: Making Kin in the Chthulucene (Duke University Press, 2016), which urgently argues for a nonanthropocentric view of climate change and is driven metaphorically and theoretically by the signifier SF—for string figures, science fact, science fiction, speculative feminism, and speculative fabulation—as she discusses here. IT’S NOT LIKE I have a vendetta against the word anthropocene—I understand the intentions of the scientists who initially proposed it in 2000 and the important work it does. But as with other big terms, it’s both too big and too small, and it proposes itself as a kind of universal in several senses, as if it’s humanity or man that did this thing, as opposed to situated human beings in complicated histories. Many people now—for example the Inuit of the circumpolar north—are acutely aware of deep and troubling changes in the world they live in. But calling it anthropocene does not gather them together, nor does it set up alliances that might be necessary. I have an allergy to the particular etymology of the anthropic: the one who looks up, the one who is not of the earth, the one whose feet are in the mud but his eyes are in the sky; the retelling, once again, of the stories that I think have done us dirt in Western cultures. That all made me think: If we can only have one word, let’s use capitalocene. But of course the fact is that we need more than one word. Capitalocene is a term I thought I had invented, but it turns out I most certainly did not. (Andreas Malm first used it in 2009 and then Jason Moore picked it up.) Capitalocene refers to the complex networks that have transformed lives for everybody on this planet. Not in the same ways, but deeply still. Capitalism is obviously based on growth—but not just any kind of growth: the growth that depends on resourcing the earth for the kind of expansion and extraction that result in profit, which is, in turn, distributed unequally. This unleashing of the motors of endless growth, extraction, and the production of ever-new forms of inequality is intrinsic to capitalism. It’s a vastly destructive process, whether you’re talking about social systems or natural systems. Capitalocene at least captures that this is a few-hundred-year-old process of building wealth through exterminationist extraction. In comparison, anthropocene implies that this is somehow a species act; that it’s the separation of whatever it is that makes us human from all else, and that it’s another human exceptionalist move. But that’s just wrong. It’s empirically, morally, ethically, and emotionally wrong. This book is about staying with all this trouble. It is about a becoming-with-each-other in another new term: what I’m calling the chthulucene. This can’t be done in the mode of critique, which is never enough. In the chthulucene, critique is one of many practices tempered by others that lead to an opening of what is still possible. Chthulu comes from chthonic—the earthly powers and processes—human too, but much more than human. But this isn’t some sort of ancient, destroyed-by-modernity story. It’s an ongoing and present story. These chthonic powers, forces, and entities are coupled with the suffix –cene, drawn from kainos, or the thick now, the present, which is not instantaneous but extends into many kinds of time, into presence. Into cultivating response-ability. Nearly every page of the book grows out of connections among art, science, and activism. Artists who are engaging in this overlap especially drew me. For example, the cover is an untitled print by Geraldine Javier. Rooted in a bony pelvis that mimes the shape of a butterfly, the image rises through a skeletal vertebral column made with vibrant filaments that ends in a butterfly with delicate coloration, constructed from dry leaves. The image has human feet—sort of—and a human pelvis—sort of. The whole thing is living and dying, insectoid and humanoid, fibrous and bony, plant and animal. It is a transformationally metamorphic piece, both disturbing and reassuring. It is also an invitation to stay with the trouble. Fiber arts recur in the book repeatedly—from the crochet coral reef project of Margaret and Christine Wertheim to old and contemporary Navajo weaving, and from cat’s cradling to string figuring. The latter is a theoretical apparatus for visual, verbal, and theoretical metaphors I use throughout the book. String figuring, one of the many “SF”s in the book, involves making patterns with others. The various partners engaging in string figuring are active and passive; in their relaying patterns to each other, threads get dropped and things become unraveled or a new pattern emerges that is a source of possibility and joy. String figuring is also akin to the way I write. Perhaps the first things that folks like me think of when they see the signifier SF are science fiction and science fantasy. But quickly come more terms: science fact, speculative fabulation, speculative feminism, so far… SF keeps ramifying into many terms that are pulled together in this signifier. One of the most urgent tasks that we mortal critters have is making kin, not babies. This making kin, both with and among other humans and not humans, should happen in an enduring fashion that can sustain through generations. I propose making kin nongenealogically, which will be an absolute need for the eleven-plus billion humans by the end of this century—and is already terribly important. I’m interested in taking care of the earth in a way that makes multispecies environmental justice the means and not just the goal. So I think of making kin as a way of being really, truly prochild—making babies rare and precious—as opposed to the crazy pronatalist but actually antichild world in which we live. It’s making present the powers of mortal critters on earth in resistance to the anthropocene and capitalocene. That’s really what the book is about.